Has Semedo Silenced all his Critics with Stunning Effort against Real? 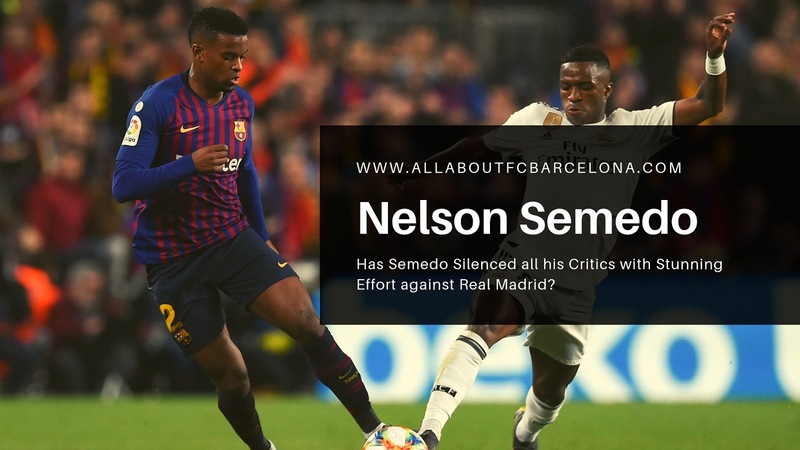 Such was the impact of the performance of Nelson Semedo against Real Madrid, many now claim we have found the perfect replacement for Dani Alves. And what does it mean for Sergi Roberto? Nelson Semedo's Barcelona career has been going in an On-Off fashion for some time. The Portuguese were acquired to replace Barcelona stalwart, Dani Alves who left on a free transfer. That was no small shoes to fill, and the Portuguese had struggled to fill those so far. Despite the early promises, he had to face tough competition from Sergi Roberto for the Right back position. And it was extremely disappointing, especially for the player to see him being relegated to the bench by a player who was predominantly a defender. When he was acquired, there was a real feeling of satisfaction among fans about the acquisition. His profile matched closely to the kind of player we were looking desperately for. Someone who is well-balanced in offense and defense. Maybe a bit more on the offensive side. We were so used to Dani Alves running up and down the pitch; anything less would be a complete no-go. The initial outings all were good, and we were confident of his potentials. But soon it turned out into a mirage, and in some matches, he got exposed completely. Soon he got demoted to the substitute role, only getting the chance when Roberto needed a break. For Semedo, it was a setback, being relegated by someone who was not a natural choice for the position. There were some good outings in between, but they were too far in between to oust Roberto. To Valverde's credit, Semedo has given enough chances to stay relevant in the side. To an extent, it is safe to say that Valverde's trust on Semedo has started to being paid off this season. From the start of this season, we were getting a feeling that Semedo is much more assured defensively than Roberto. But still his offensive contribution, especially linking up with Messi was a huge question mark! He handed the tough task of dealing with an inform Vinícius Júnior brilliantly. It is safe to claim that he had the Brazilian in his pocket and that mattered the most with an uncharacteristically error-prone midfield. He along with Pique was the main reason why the score remained 1-0 at half-time, maybe with a bit of help from some dodgy decision making by Madrid players. Semedo stood out from the rest of the players while going forward. Malcom was the only player who matched him in the offense. And it was no surprise that the majority of Barcelona's attack was coming from the right-hand side. Together they were a deadly duo, pinning Marcelo back for most of the night. Click here to book your Real Madrid v Barcelona tickets for this Copa del Rey match as soon as there is a match scheduled between these teams. In the past also Semedo has produced decent performances. But as I wrote earlier, he was not that consistent. Then why are we going crazy about this performance of his? The answer is pretty simple, against Madrid Semedo showcased what he brings to the side when playing in top form. That's something which no other players could bring on the right flank. He remained so assured in both attack and defense, even Dani Alves at his prime would have struggled to match him. But then there is the obvious question regarding consistency. But this display has definitely moved him higher in the pecking order, that means he will get more opportunity to demonstrate consistency. Is it the End of the Road for Sergi Roberto? Sergi Roberto has been the all-role, all-season utility player for Barcelona for some time. I guess it's only the Goal Keeper position that is left for him to try now. He has been the first choice Right Back for Barca, but what happens to him now. It all depends on how consistent Semedo remains. If his form wobbles, expect Roberto to step in immediately. With Roberto, there is always a minimum guarantee, regardless of whichever position he occupies. On the positive side, this should get him another chance to try to make it into the midfield, his natural position. And maybe even try his luck on the left flank, you never know; after all, he is Sergi Roberto.